Yesterday our city, Modiin, held a book swap where everyone was invited to bring old books or dvd's in good condition and to choose other ones to take home from the collection. We took 5 items and were told we could 'on our honor' take home 5 alternate items (ie. there was no tickets or checking involved). 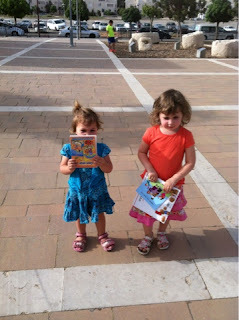 I took some healthy snacks in my bag and the kids and I had fun choosing books and a dvd. There was also a nice activity run by volunteers from the ecological farm in the area. 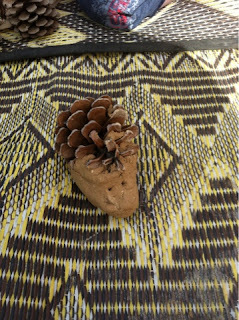 Instructions: how to make the porcupine, take a pine cone and lay it on its side, squash a fistful of clay onto the side of the pine cone, leaving a lump near the pointed side of the cone. Mold the lump into the shape of a nose and smooth all the sides. Finally, take a stick and poke holes for the eyes. I am a mom, a wife, a doctor, living with my husband the mortgage broker, and two small kids. How to make a dollhouse from a cardboard box. Have you run out of indoor crafts for kids? How to be productive with old birthday cards? Go check out these products! 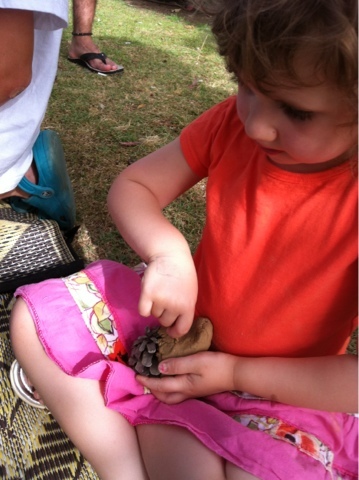 What is a kids' stuff swap? What's a doctor doing - going green ?